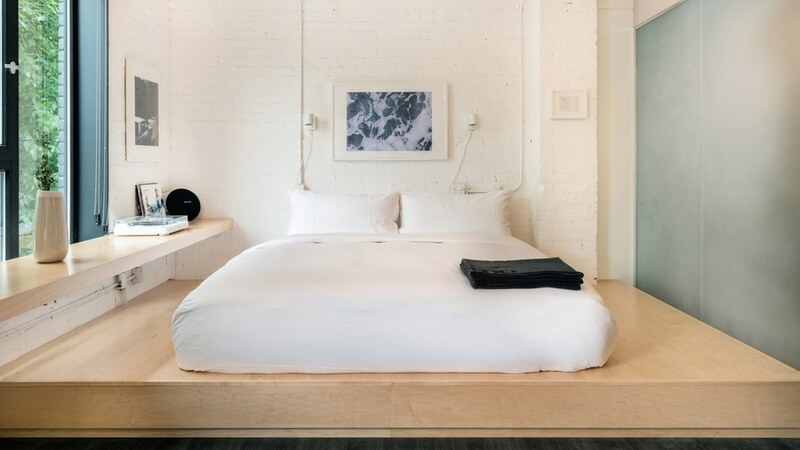 Toronto firm StudioAC has used plywood to build custom platform beds and expansive desks for the rooms of this boutique hotel in the city. 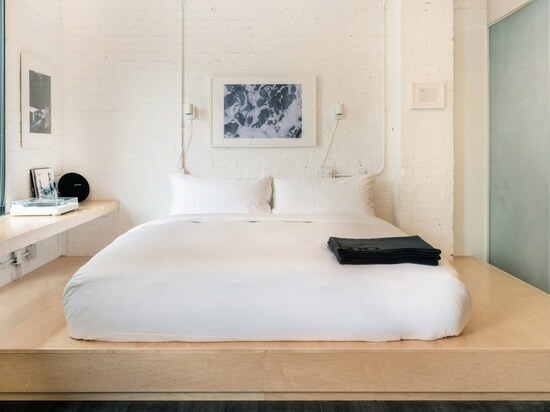 The Annex hotel is located in the Toronto neighbourhood of the same name, and is housed in a century-old, three-storey brick building. "The building was originally built as horse stables with an industrial steel structure and exposed brick walls, four wythes deep," said StudioAC. "The building is on quite an atypical lot for downtown Toronto." The local studio overhauled the mixed-use building, which most recently housed apartments and a bar, to create a boutique hotel with 24 rooms.Each features at least two large windows that fill the spaces with natural light, and has a minimal yet homey aesthetic with plywood built-ins and exposed brick walls. All of the hotel rooms differ from one another in layout, but are cohesive in their use of the custom plywood furniture. "The significant frontage is on Barbara Barrett Lane, with a 150-foot (46-metre) south-facing facade," said StudioAC. "This allowed us to create atypical suites for a hotel room. Rather than long narrow spaces with a window at the end, we were able to produce a plan that utilises the width of the existing building." The plywood elements form platform bed constructions that span the length of the rooms, as well as desktops and cabinets. 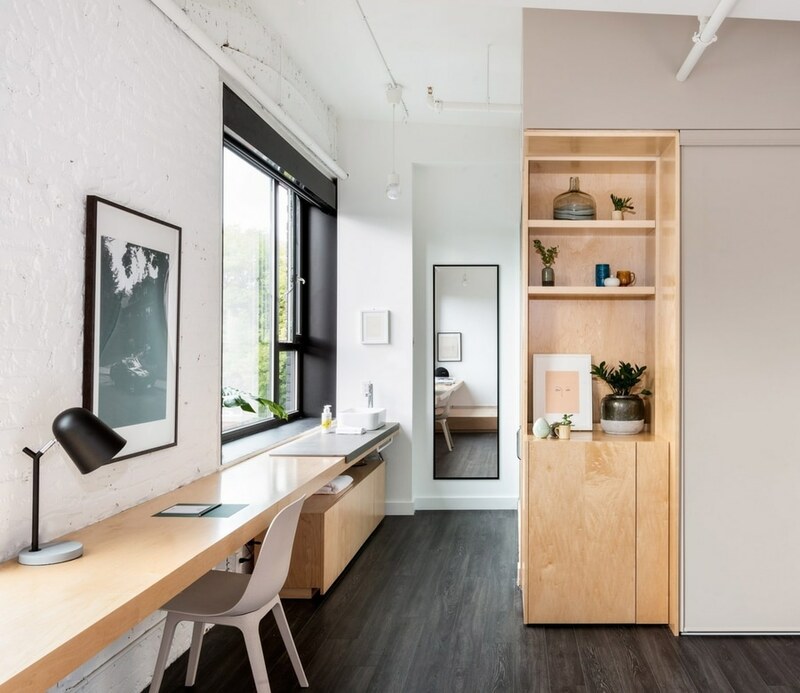 "In an effort to minimise the cost of furniture, the elements in the rooms were mostly built from plywood – a cost-effective millwork solution that gives identity to rooms," StudioAC said. For the beds, oversized frames create a step up to the mattress, with small nooks to stand and sit on above the floor. Expansive desks enhance the length of the rooms, and also incorporate a bathroom sink within the sleeping area. "This element transforms from a decorative surface to a desk space, and then to the washroom vanity, while acting as a functional graphic that leads the eye between and across the space," the studio said. The open-sink concept frees up the available space, so frosted glass walls concealing the toilet and shower are the only partitions necessary.Dark grey floors and exposed brick walls are painted white, with furnishings and accents similarly coloured in grey, taupe and black to keep the rooms minimal. The hotel rooms are also designed to feel lived-in, with decorative elements like potted plants, a record player, artwork and chairs.StudioAC often designs clever space-saving solutions, as demonstrated in a handful of residential projects completed in Toronto. Examples include a renovated home where a plywood unit forms a storage are and a dog bed, and a studio apartment fitted with a white box that acts as a sleeping nook.